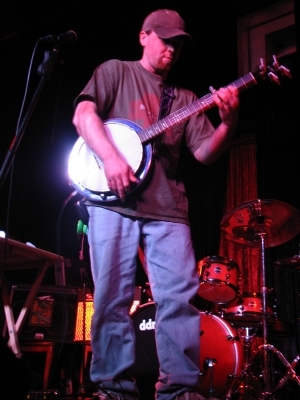 Having honed his craft in the basements and the back rooms of house parties, the jump to music venues in late 2007 was a natural progression for Kansas City electric banjo wizard Ben Hoppes. After spending a year hitting the local bars and clubs, Ben's music is firing on all cylinders. In his hands, the custom built Mockingbird Stingray electric banjo is a force to be reckoned with, with the bass, the rhythm and the sonic backdrops all coming from this one remarkable instrument. At first it will leave new onlookers scratching their heads, but it never takes long for them to all come to the same realization: This Guy's Good. Utilizing a swiss army knife of effects and live electronics, Ben can easily create a sound that will fill even the largest rooms. As he stands, meditating, at the center of the swirling loops and walls of sound, his blistering solos fly straight through the heart of it all and his quirky, insightful lyrics hover above like the voice of your subconscious.